Centrally located in Neustift, this pension offers spacious rooms with a balcony and views of the Stubai Valley. Guests can enjoy BBQs in the garden and relax in the hotel’s sauna and solarium. With free Wi-Fi, rooms at Pension Kristall come with wooden floors, a satellite TV and seating area. Each of the modern rooms has a spacious bathroom. The sun terrace at Kristall offers a pleasant setting for a drink after a ski trip or some hours of hiking. Guests can store their materials in the ski storage room with its ski boot dryers. Guests can go horse riding or take a short walk to the Freizeitzentrum with its indoor pool, a 2-minute walk away. It is also possible to rent bicycles or to chat with other visitors in the pension’s games room. A free ski bus is available within 100 metres from the property. Innsbruck is 20 km away, while the Stubai Glacier Ski Area is 16 km away. Located in Neustift in the Stubai Valley, Hotel Bellevue features a sauna, an infrared cabin and a steam bath as well as a sun terrace overlooking the Tyrolean mountains. The free ski bus stops right outside. The Bellevue’s traditionally furnished rooms feature cable TV, a minibar, and a bathroom with hairdryer. Some rooms also have a balcony. Guests can relax in the garden or in the fireplace room. Free WiFi is available in public areas. Hotel Bellevue’s restaurant serves traditional Tyrolean cuisine, with many regional specialities and seasonal dishes. Half-board includes a rich breakfast buffet and a 4-course dinner. Special dietary needs can be accommodated on request. Admission to Neustift’s public swimming pool is free for guests of the Bellevue. Free private parking is available at Hotel Bellevue, and Innsbruck is only a 20-minute drive away. From late May to mid-October, the Stubai Super Card is included in the rate. This card offers many free benefits and discounts, including free use of local cable cars and public transport in the valley and to Innsbruck. Located in the heart of the Stubai Valley, this family-run hotel is a 20-minute drive away from both Innsbruck and the Stubai Glacier. Hotel Steuxner features a pond in the big garden and a spa area with 2 saunas, a relaxation room, and exercise machines. Massages are also offered. Half-board comprises a rich breakfast buffet and a 4-course dinner. Hotel Steuxner also features a cosy fireplace lounge and a bar. A lake with a children’s playground and a beach volleyball court is nearby. A bus stop is only a 2-minute walk away from Hotel Steuxner. From 22 May until 11 October, guests receive the Stubai Super Card Guest Card for free. It includes free use of public transport to and from Innsbruck, free access to public pools, free use of one local cable car per day and one ride with the Mieders Summer Toboggan run per day. Featured amenities include a business center, luggage storage, and laundry facilities. A roundtrip airport shuttle is complimentary (available on request). Hotel Augarten is just 200 metres from the centre of Neustift in the Stubai Valley and only a 2-minute walk from the Elfer Ski Lift. It includes a modern spa area and offers free WiFi. The spa area includes various saunas, a steam bath, a hot tub, an infrared cabin, and a relaxation room with a tiled stove. Massages and the use of the sun beds are available at a surcharge. The Alpine-style rooms feature wooden furnishings, satellite TV, and a private bathroom. Breakfast is available every morning and dinner can be booked on request at the Augarten. Facilities at the Augarten Hotel also include a bar and a children’s playroom with tabletop football. Sleds can be rented from the property free of charge. Free private parking is available. In winter, guests can buy ski passes at the reception and use a ski storage room with a ski boot dryer. A ski rental and ski school are directly opposite the hotel. The stop of the ski bus to the Stubai Glacier is only 40 metres away. The nearby Elfer mountain offers ski slopes as well as 2 long toboggan runs. In summer, the hotel provides free hiking sticks and daily hiking tips. From late May to mid-October, the Stubai Super Card is included in the rate. This card offers many free benefits and discounts, including free use of local cable cars and public transport in the valley and to Innsbruck. 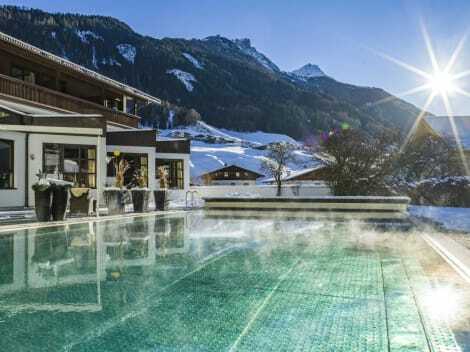 This family-run 4-star hotel is only a 5-minute walk away from the village centre of Neustift and features a spa area with a panoramic indoor pool. The Elferlifte Cable Car, an all-year cable car, is right in front of Hotel Berghof. The restaurant serves Austrian and international cuisine made from regional products. Half-board can be booked on site. At the Berghof, bathrobes, bicycles and toboggans are available for guests' use free of charge. Free WiFi and free parking are also provided. From late May to mid-October, the Stubai Super Card is included in the rate. This card offers many free benefits and discounts, including free use of local cable cars and public transport in the valley and to Innsbruck. The Cappella Natura Vitalis Hotel enjoys a quiet location in the Neder quarter of Neustift in the Stubai Valley. It offers Tyrolean and international cuisine, a spa area, and free WiFi. The wellness area includes indoor and outdoor rest areas with mountain views, a Finnish sauna, a steam bath, a bio sauna and an infrared cabin. Moreover, you can choose from a wide range of massages. Sun loungers in the garden invite you to relax and from the 2 terraces you enjoy views of the Stubai Alps. Sports equipment and hiking boots can be stored in a separate room. Several hiking and biking paths start right in front of the hotel. The Kampler swimming lake can be found about 1 km from the hotel. As a guest of the Capella Hotel, you can take advantage of special rates at the nearby bike rental. From late May to mid-October, the Stubai Super Card is included in the rate. This card offers many free benefits and discounts, including free use of local cable cars and public transport in the valley and to Innsbruck. Hotel Stubaierhof is located directly opposite the Elfer ski lift in Neustift in the picturesque Stubai Valley. It features a large spa area including an indoor pool and offers free internet access. Innsbruck's city centre is a 25-minute drive away. The stop of the free ski bus and various shops for sports equipment can be found right next to the Stubaierhof. Cross-country ski runs and winter hiking trails lead right past the hotel. The Stubaierhof has a large spa area with a sauna, a selection of massages, and an indoor pool with mountain views. All amenities of the Hotel Stubaierhof can also be used by guests of the annex apartments and the annex deluxe suite in the Fuchshof, 450 metres from the hotel. The spacious and comfortable rooms are furnished with natural wood and decorated in an Alpine-style. They feature big bathrooms and a balcony also offering views of the Alps. The restaurant serves traditional Tyrolean specialities and international cuisine. Half-board comprises a breakfast buffet, home-made cake and strudel in the afternoon and a 5- or 6-course dinner. Several ski areas, including the Stubai Glacier, are very close to Hotel Stubaierhof. A storage room for sports equipment is a further feature of the property. You can take part in various activities like guided hikes, Nordic Walking or snow-show tours, toboggan evenings or skiing afternoons free of charge. Guided tours to Hotel Stubaierhof's own mountain hut are provided and free overnight stays are offered on request. From late May to mid-October, the Stubai Super Card is included in the rate. This card offers many free benefits and discounts, including free use of local cable cars and public transport in the valley and to Innsbruck. Alpenhotel Fernau is located above Neustift in the Stubai Valley, at 1,000 metres above sea level. It offers free Wi-Fi, rooms and an apartment with balcony, a heated outdoor pool, and free parking. The free ski bus stops right on the doorstep. Half-board includes a breakfast buffet, a daily cake buffet, and a 4-course dinner with a choice of dishes and a salad buffet. It is also available on request for the apartments. Alpenhotel Fernau features a spa area with a gym and a range of massages. There is also a children’s playground and a tennis court. This charming hotel can be found in Neustift. Rastbichlhof features a total of 54 accommodation units. No pets are allowed on the premises. Situated in Neustift in the Stubai Valley, Hotel Sonnhof offers a spa area and many facilities for children. The restaurant has a summer terrace with panoramic mountain views. Rooms here are fitted with traditional wooden furniture. Each has a balcony, satellite TV, and a spacious bathroom. Children get their own bed linen with comic scenes and have a special menu at the restaurant. There is a play room full of games, toys and puzzles. Outdoors, there is a large play area in the garden. The elegant spa includes 4 different types of sauna and 2 steam baths. Guests can also relax in the hot tub. Neustift Leisure Centre is about 500 metres from the Sonnhof and offers an indoor pool and bowling alley. The Stubai Glacier and Fulpmes-Telfes Ski Areas are nearby. From 25 May to 15 October, the Stubai Super Card is included in the rate. This card offers many free benefits and discounts, including free use of local cable cars and public transport in the valley and to Innsbruck. lastminute.com has a fantastic range of hotels in Neustift im Stubaital, with everything from cheap hotels to luxurious five star accommodation available. We like to live up to our last minute name so remember you can book any one of our excellent Neustift im Stubaital hotels up until midnight and stay the same night.